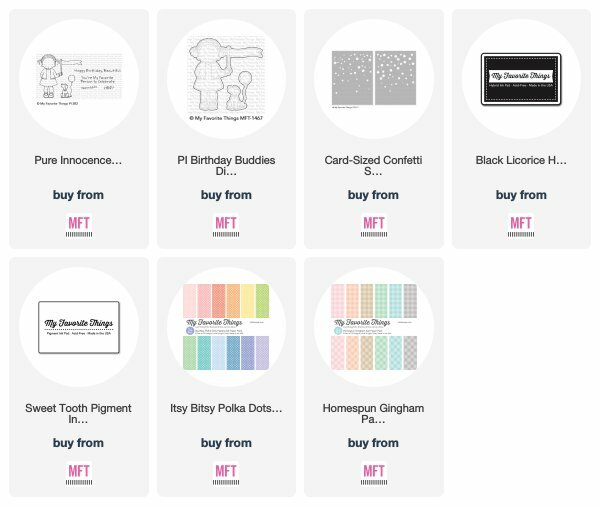 MFT February Release Countdown Day 3! Gosh, already we have reached halfway of the countdown, the time certainly is zooming by.. I am sharing one of the latest Pure Innocence Girls this month and you are in for a treat, this month they are release not just 1 but 2 of these little beauties.. I chose to work with Birthday Buddies, stamping out and colouring in with Copics and restamping onto pattern papers for her dress and little cardigan, papers from the Itsy Bitsy Polka Dot Pastels and Homespun Gingham..
Once everything was adhered, I die cut her and the sweet little puppy side kick and set these aside.. I then took a trimmed piece of white card stock, adding some post-it tape to mask off an area, then I added Dried Marigold Distress Ink, leaving the centre of the panel with a glow effect..
Before I took the masking tape off I added some stenciling with the latest stencil called, Card Sized Confetti, blending in some Sweet Tooth Pigment Ink.. I stamped a sentiment at the base of the inked panel, then took the masking tape off and added my images.. I hope you find loads of inspiration today over at the blog, I will be back with Day 2 tomorrow..
Have a fabulous crafty weekend!